The night before NanoWriMo – happy Halloween! It is indeed that time of the year – today is Halloween, which makes tomorrow the start of NanoWriMo! That means there are a couple of traditions about to kick off – the sequestered writing sessions, the mad dashes when work intervenes and I have to lock myself off for a few days, and of course – the Shearing. 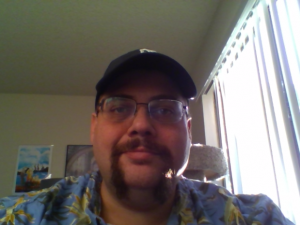 I started doing this a few years ago, before I’d even heard of MoVember. Everyone thinks I shave it all of on Halloween and grow it in November as a tribute to that cause, but the truth is less admirable. It’s really a combination of my being lazy, plus a personal challenge (of sorts) – how much beard will it take to write this novel? You see, growing a beard is an itchy and sometimes uncomfortable prospect. Now that we live in California, it’s even more complicated by the days being too warm to be comfortable (to me) in a beard. The growing of the beard is intended as an inspiration to write faster. It’s a reminder that when I stop, I can shave again. That mug on the page, though? That’s just me goofing around. I shaved off the middle of the goatee today, in a vaguely lame attempt at a self made costume that didn’t actually come together. Later tonight, I’ll be shaving the rest of it off. Tomorrow morning (I hope), I will be firing up Novlr and beginning my daily words for the next month. It’s never really about finishing, but about the practice involved. If you’re taking part this year, feel free to hit me up as an official – or unofficial – NanoWriMo buddy. I’ll try and keep these posts going through the month, though I make no guarantees. But I will take a few pictures of my mug along the way so you can get an idea of how well its going.